The species name water vole from Latin Arvicola terrestris can be translated as „inhabitant of the ground” and really this animal spends most of its life in burrows as a typical rodent. As the species name suggests it is connected with water. However, in late autumn this small animal can wander far away and settle down at very dry potato field or orchard. Here they dig burrows like moles and those who do not know may mistake water vole burrows with molehills. 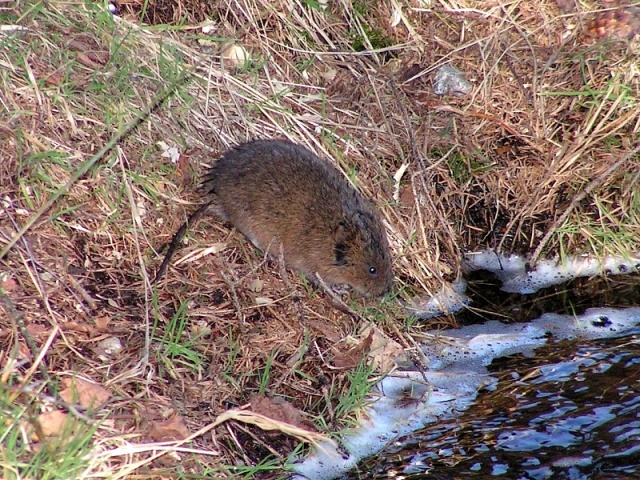 Molehills usually are more or less round while water voles burrows are oblong. At steep slopes vole make a den in a burrow while at lower places they build it in grass. In winter the den is made under snow and after it melts down it can be found as round grass ball lying about in a meadow. In front of their burrow water vole make something like a lawn – they make a small area with shortly gnawed grass. On the bank or grass shrub they develop “dining tables” where they gather and eat food they’ve found nearby. When the tasty part has been eaten the vapid parts are left behind and develop a layer. In natural habitats they feed on reed and yellow water-lily rootstock, rush, arrowheads, sedge seeds, etc. Sometimes they catch some insects, snails or small fish. In good circumstances they mate several times a year and sometimes have up to 10 baby voles. At some places they may do damage to gardens if they are too much, but we should not forget that water vole is a very important part of ecosystem. They develop burrows that are used by different insects, amphibians and small mammals. They are valuable food for different animals. Using modern technologies we may decrease the harm done by Water Voles, but by exterminating these animals we would cause serious damage to nature and lose very significant and interesting species.